Rainbow Ranch Lodge is an intimate twenty-one room hotel and gourmet restaurant located on the banks of the Gallatin River in Big Sky, Montana. Whether riverside or pondside, accommodations at Rainbow Ranch Lodge provide a sanctuary for post-adventure relaxing or a romantic getaway for two. 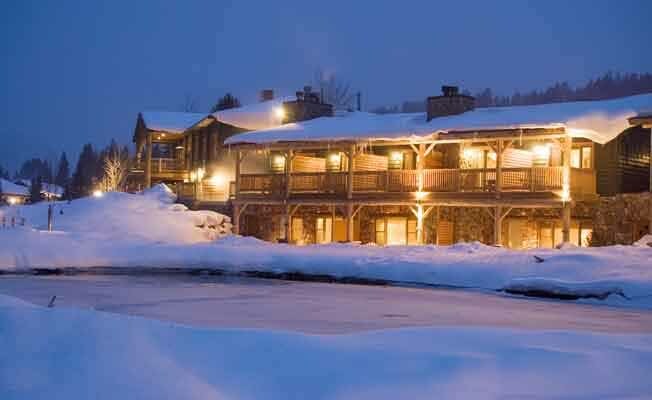 Located in a sweeping valley in the heart of the Rocky Mountains, the Rainbow Ranch Lodge's location is ideal for both summer and winter activities. Our proximity to Yellowstone National Park affords our guests endless opportunities for outdoor adventure and exploration, including world-class fly fishing, horseback riding, hiking, whitewater rafting, and kayaking. As one of the top 10 winter destinations in North America, the Big Sky area offers a variety of winter activities including downhill skiing at Big Sky Resort, Moonlight Basin and Lone Mountain Ranch, as well as cross-country skiing, snowshoeing, snowmobiling, dog sledding, and winter fly fishing. Whether you choose an experienced local guide service or venture out on your own, the breathtakingly rugged, natural beauty of southwest Montana will restore and rejuvenate your senses. In our cozy restaurant on the banks of the Gallatin River, the culinary team at the Rainbow Ranch Lodge consistently delights guests with refined cuisine and classical cooking techniques which transform Montana beef, bison, wild game, and fresh seafood into flavorful works of art. Our charcuterie platter features house-made delicacies from duck prosciutto and wild boar sausage with huckleberries to bison kielbasa with Guinness infused whole grain mustard. With an impressive array of entrees like mesquite grilled, espresso rubbed bison hanger steak, sweet corn and brioche stuffed roasted quail, herbs de Provence marinated Alaskan King salmon or pan seared rocky mountain elk loin, it can be difficult to decide. Before you dive into your Rainbow Ranch culinary experience, relax into a cozy couch in our lounge while sipping a hand-crafted cocktail and sampling delectable bites from our small plates menu. Whether seeking a glass of fine wine by the fireplace or a hand-crafted, barrel-aged cocktail in the casual comfort of the bar to start your evening, our unique selection of libations are sure to delight the senses. Stored through glass panels and river rock columns, The Bacchus Room houses Rainbow Ranch Lodge's award winning wine collection, which is one of the finest in the state. With a capacity of over 5,000 bottles, we cellar a wide variety of wines ranging from new world whites to old world reds. Wines stored in the state-of-the-art wine room, frame an intimate setting for private dinner parties and wine tastings for up to 12 people. Focusing on wines from California, the Pacific Northwest, and many other regions from around the world, diners are always able to find something that appeals to them. Simply put... whether you are a novice wine enthusiast or dedicated connoisseur, Rainbow Ranch Lodge wants to offer the most exciting wine experience to each of our guests. Located in the heart of the Rocky Mountains in southwest Montana, the Rainbow Ranch Lodge and Big Sky/Yellowstone area offer a vast playground to outdoor enthusiasts. With breathtaking natural beauty, ideal geographic features and experienced local guide services, guests can experience rugged outdoor adventures by day and savor the luxurious comforts of the Rainbow Ranch Lodge by night.